It’s a really hard thing for me to do, but I’m going to try, yet again, to blog. A little about me: I’m Caroline *waves* I’m a designer and an aspiring writer. I have a short story called RUNNING LATE published in PROPOSE TO ME, A ROMANCE ANTHOLOGY from Satin Romance. That’s my name on this cover! I designed it and published my first story in it! Other fun things about me: I have a husband and two little girls (eight and soon-to-be-four at the time of this blog post). I’ve been fortunate for the past 4 years to be able to work very part time out of the house and spend lots of time with my daughters. Things I enjoy: Music – Pandora and Spotify are some of the best things ever, some of my favorite stations on Pandora include Backstreet Boys, One Direction and Linkin Park. Movies – I love a good RomCom but I don’t discriminate (except against horror, I don’t like to be scared and I’m a wuss.) Designing – I like pretty things. Pictures, websites, promo materials for authors, etc. Part of my bookshelf. Don’t mind the poor cell phone quality photo! 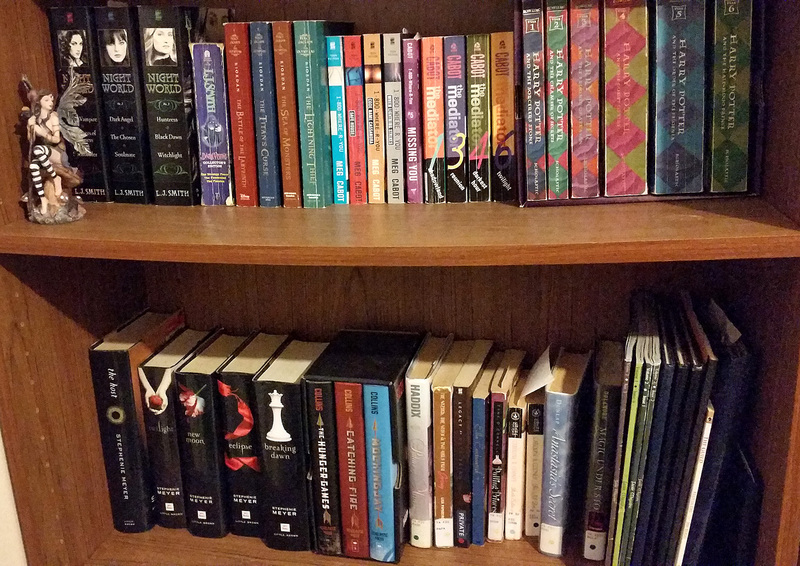 Books I enjoy: I’m a YA addict. Harry Potter brought me back to reading after a long hiatus between high school and college. I read the books when they were first published in the US, but during college I fell out of reading. Tragic. Then my friend Lynsee told me about Twilight. We were working overnights together at the time so I got my hands on the audiobook and, BAM. Completely hooked and haven’t looked back. Now is probably a dumb time for me to start blogging because I’m about to embark on a new seasonal (potentially turning into full time) job. I’m really excited for this job because I worked for this company back in 2008 (the overnight job just mentioned), but then the economy went down the toilet and they let go of most of the staff on my shift. I’ve been out of the full time work force so long this is going to be a challenge! Especially because I also work from home for online publisher Melange Books, LLC and both of it’s imprints. That keeps me super busy, but I’m working on my time management skills. Uh…. And I should probably mention it’s after midnight and my brain isn’t really able to focus and stay on topic right now. #SorryNotSorry Don’t take this as a genuine representation of my writing skills. Please? So, I guess I’ll let you know what plans I have for this blogs. Well, it’s going to be a little of this and that. Book reviews (which also appear on Goodreads), maybe a feature of “What I’m Watching” (which will mostly be a recap of my Netflix obsession – I just finished season 4 of Walking Dead and it’s killing me that season 5 isn’t up yet! Especially since I’m too cheap for cable!) I also plan to showcase some of my covers I’ve designed (did I mention I design book covers? Because I do.) And, if I find time to actually write, I’ll share some outtakes or snippits of upcoming stories. Who knows. This is an anything goes kinda place! Leave a comment to say hi. Let’s be friends?